The Falcon Heavy is the latest advance from the rocket company SpaceX, and it's a step toward the company's goal of sending people to Mars. "The future is vastly more exciting and interesting if we're a spacefaring civilization and a multi-planet species than if we're not," said SpaceX founder Elon Musk in a recent speech. The Falcon Heavy's price tag is around $90 million, says John Holst, a research analyst at the Space Foundation. "That's a deal," Holst says, "if it works. So we have to see if that happens." 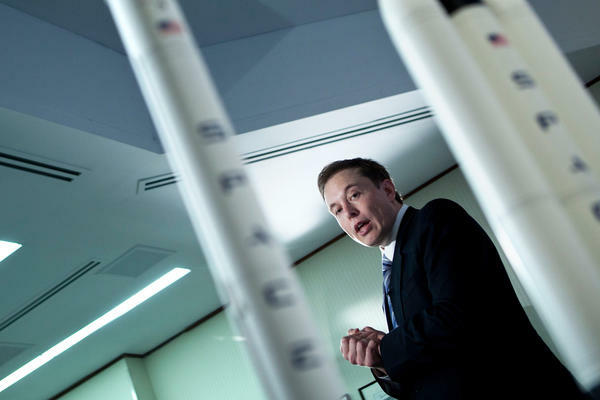 He says it has been fun to watch an upstart like SpaceX rocket ahead, noting that the company had 18 launches last year. "They captured about 20 percent of the global market," Holst says. "If they were a country, they'd actually have equaled China as far as launch numbers." All of those recent launches have used the company's workhorse, the Falcon 9. The new Falcon Heavy is basically several of those rockets strapped together. "This is a rocket of truly huge scale," Musk told reporters in 2011, when he unveiled plans for the Falcon Heavy. He said the behemoth was being designed to take a tremendous payload to orbit — more mass than, say, a Boeing 737 fully loaded with passengers, luggage and fuel. "That is really, really humungous," noted Musk. "It's more payload capability than any vehicle in history apart from the Saturn V" — NASA's famous moon rocket. Back then, he anticipated it would first fly in 2013. 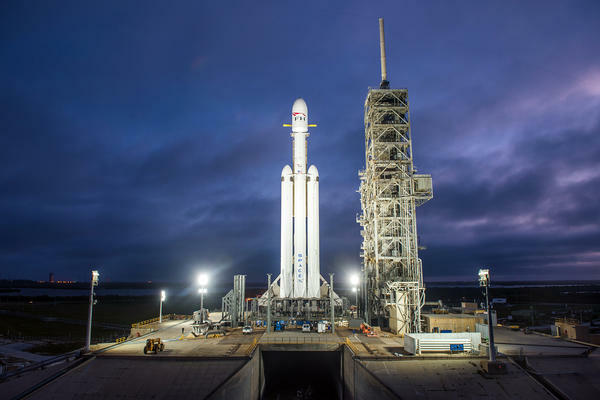 Five years behind schedule, the Falcon Heavy is now poised to take off, standing over 200 feet tall on a historic launch pad, used by the Saturn V rocket and the Apollo 11 astronauts, at NASA's Kennedy Space Center in Florida. "It's exciting that he has built this rocket because it's clearly not for traditional commercial purposes of launching satellites. It's really for sending spacecraft farther away, to the moon and, you know, as far as Mars," says Leroy Chiao, a former NASA astronaut who serves on a safety advisory council for Space X. "If you're going to launch a satellite, you really don't need or want a rocket that big — the reason being, satellites aren't that big," says Chiao. "And so the only reason you'd need a rocket like that is to launch something far away, say to Mars." This first flight does have a payload that will be jettisoned into deep space. On Twitter, Musk said he is launching a cherry-red electric sports car made by one of his other companies, Tesla. Musk wrote that his car will be playing the song "Space Oddity" and "will be in deep space for a billion years or so — if it doesn't blow up on ascent." A rocket more powerful than any other flying today is set to blast off for the first time tomorrow afternoon if all goes well. The Falcon Heavy is a monster rocket from the company SpaceX. And as NPR's Nell Greenfieldboyce reports, it's a step towards the company's goal of sending people to Mars. NELL GREENFIELDBOYCE, BYLINE: SpaceX founder Elon Musk wants humans to become Martians. In speeches, he is dead serious. ELON MUSK: The future is vastly more exciting and interesting if we're a spacefaring civilization and a multi-planet species than if we're not. GREENFIELDBOYCE: That's why he created SpaceX - to drive down the cost of space flight. Its low, low launch prices have quickly attracted plenty of customers like satellite companies and the government. John Holst is the senior research analyst at the Space Foundation. He says it's been fun to watch an upstart like SpaceX rocket ahead. JOHN HOLST: You know, last year - what was it? - 18 launches. So they captured about 20 percent of the global market. You know, if they were a country they'd actually have equaled China as far as launch numbers. GREENFIELDBOYCE: All of those recent launches have been the company's workhorse rocket, the Falcon 9. But to go boldly where no one has gone before, SpaceX has been working on something bigger - the Falcon Heavy. MUSK: This is a rocket of truly huge scale. GREENFIELDBOYCE: That's how Elon Musk first introduced the Falcon Heavy to a group of reporters seven years ago. He said the behemoth was being designed to take a lot of mass to orbit, more than, say, a fully loaded Boeing 737 with passengers, luggage and fuel. MUSK: That is really, really humongous. It's more payload capability in any vehicle in history apart from the Saturn 5. GREENFIELDBOYCE: NASA's famous moon rocket. Musk showed a promotional video for the then-yet-to-be-built Falcon Heavy. A computer-generated image of a more than 200-foot-tall white rocket blasted off, trailing a white cloud of exhaust. GREENFIELDBOYCE: So when would this vision become reality? Oh, Musk said, sometime in 2013. Well, now it's 2018 and a Falcon Heavy is finally standing upright on a launch pad in Florida. The real rocket briefly fired its engines last month. GREENFIELDBOYCE: SpaceX released a video of it belching out a real white cloud. Musk called it quite a thunderhead of steam. He said the test results looked good. Coming up next is the launch. LEROY CHIAO: It's exciting that he has built this rocket because it's clearly not for traditional commercial purposes of launching satellites. It's really for sending spacecraft farther away to the moon and, you know, as far as Mars. CHIAO: You really don't need or want a rocket that big, the reason being satellites aren't that big. And so the only reason you'd need a rocket like that is to launch something far away, say, to Mars. GREENFIELDBOYCE: This first flight will indeed send something out to deep space - a car. On Twitter, Musk said he's launching a cherry red electric sports car made by one of his other companies, Tesla. The car's speakers will play David Bowie's "Space Oddity." Musk wrote that his car will, quote, "be in deep space for a billion years or so if it doesn't blow up on ascent." Nell Greenfieldboyce, NPR News. DAVID BOWIE: (Singing) This is ground control to Major Tom. You've really the made the grade. And the papers want to know whose shirt you wear. Transcript provided by NPR, Copyright NPR.